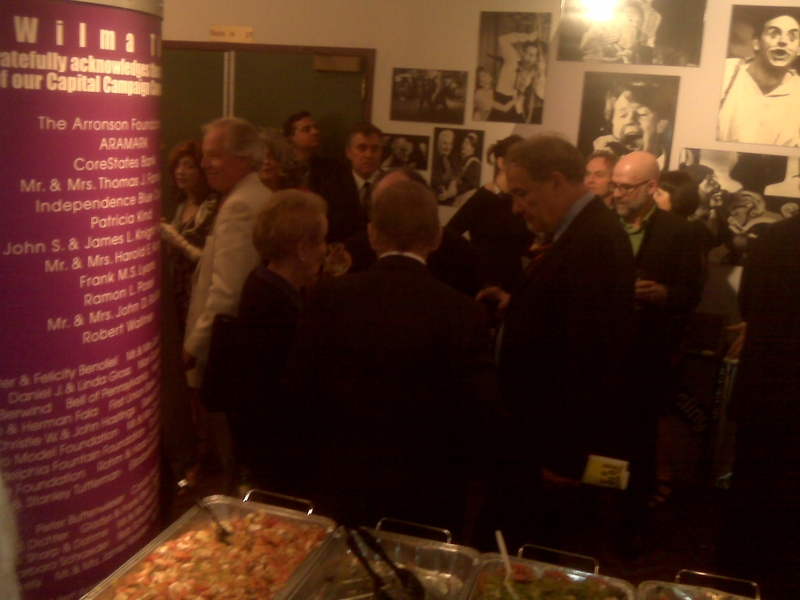 Madeline Albright, at left sipping a drink, alongside Vaclav Havel, with his back to the camera, at the Wilma Theater on May 26, 2010. Former U.S. Secretary of State Madeleine Albright seemed to enjoy the production just fine. That was the lede I submitted to Philadelphia events blog uwishunu in my review of last month’s U.S. premiere of ‘Leaving,’ the first piece in a generation from acclaimed playwright and former Czech President Vaclav Havel, at the Wilma Theater on the Avenue of the Arts in Center City Philadelphia. Both after leaving the bathroom before the show and sitting in my third-row seat as the curtain opened, I eyed the tiny, graying lady sitting to the right and chatting with Havel, the revolutionary who was on hand to watch the premiere. Both times I gave second glances. The first time, I just thought I recognized her and dismissed it as some Philadelphia notable. The second time, my guess was clear: that woman was the first female Secretary of State and President Bill Clinton top adviser. I dismissed it again — no security, no commotion, no press. Turns out I was right, and, boy, that has to mean something for the future of news, doesn’t it? It’s Memorial Day, so no one’s reading this anyway, right? In February I announced that I was blogging for uwishunu.com, a popular, award-winning arts and entertainment blog for Philadelphia. Some months I write more for them than others, not all run as expected and some are of only middling interest to casual readers, so I’ve decided I’d like to do a monthly digest of my work there — if only just for record-keeping. I’ll post them as I file them, not as they run. See all of my posts here, and my profile here. Below — later than I’ll do this in the future — see my April posts. If you peeked at my Blogging clips on this Web site recently, you may have noticed that I have begun contributing to uwishunu.com, a very cool arts and entertainment blog in Philadelphia. If you have managed some RSS feed for my Disclosures on this site, you may also have seen that uwishunu is a product of the Greater Philadelphia Tourism and Marketing Corp., which means I am currently receiving small funds from a public relations organization. I’m over it and hope you are, too. If it causes a conflict, we’ll cross that bridge when we have to. Because, right now, I enjoy the work and love the product – I was subscribing to uwishunu long before I became involved. Below check some of my work and extras from those assignments.